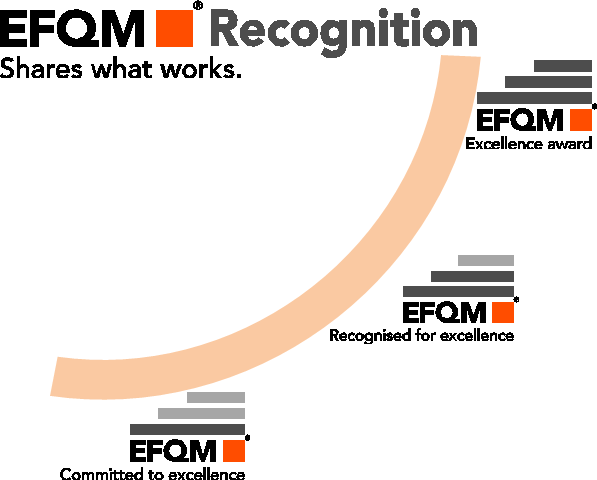 EFQM has established different Recognition levels depending on how high performing your organisation is. The objective of the EFQM Excellence Award is to recognise Europe’s best performing organisations, whether private, public or non-profit. It recognises industry leaders with an indisputable track record of success in turning strategy into action and continuously improving their organisation’s performance. EFQM Recognised for Excellence combines an externally validated analysis of your organisation’s performance recognising your achievements. It provides you with a framework to increase your competitiveness, productivity and efficiency. You will understand how well your current management practices are delivering the results and you will discover learning and improvement opportunities. EFQM Committed to Excellence is developed to introduce you and your organisation to business excellence. There are 2 options, both designed to provide your team with a simple and sustainable start on your journey towards excellence. EFQM Committed to Sustainability is designed to provide a holistic 1 day assessment of an organisation’s sustainability strategy. The assessment explores 4 themes; People, Planet, Profit and Products.